London-based architecture collective Assemble has emerged as one of the most unorthodox and innovative practices of recent times. As recipients of the prestigious Turner Prize in 2015, their socially engaged projects have garnered attention from the fields of art and architecture alike. 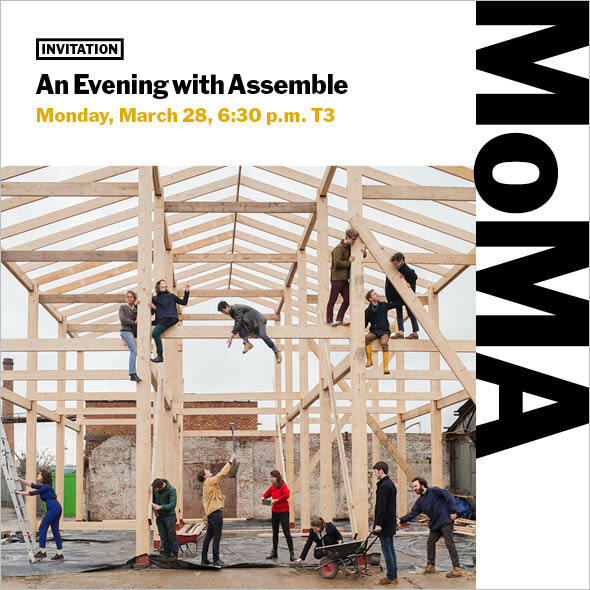 Join us for a timely and compelling conversation about Assemble’s enterprising strategies, alternative approaches to building, and spatial tactics for social activism. Panelists include: Fran Edgerley and Paloma Strelitz (Assemble); William Menking (Editor-in-Chief, The Architect’s Newspaper), Michael Meredith (Partner, MOS Architects), Esther Choi (Assistant Professor, OCAD University), Martino Stierli (The Philip Johnson Chief Curator of Architecture and Design, MoMA), and Sean Anderson (Associate Curator of Architecture and Design, MoMA). Please use the entrance at The Lewis B. and Dorothy Cullman Education and Research Building, at 4 West 54 Street. RSVP to adevents@moma.org : Space is limited, and RSVP is required. This event is co-sponsored by OCAD University, Toronto, Office of the President. Esther Choi is an architectural historian whose research interests center on the entanglements between architecture and the sciences in the nineteenth and twentieth centuries, and the intersections between artistic and architectural movements throughout the twentieth century. Though based in New York, she has been an assistant professor at OCAD University in Toronto since 2008. She is currently completing a joint Ph.D. at Princeton University in the Department of Architecture and the Interdisciplinary Doctoral Program in the Humanities. Choi received a MDes (History and Theory) from Harvard Graduate School of Design, M.F.A. from Concordia University, and B.F.A. from Ryerson University. Her writing has appeared in publications such as Architectural Review and Art Papers, as well as exhibition catalogues such as Hippie Modernism: The Struggle for Utopia(Walker Art Centre, 2015). She is the coeditor of Architecture at the Edge of Everything Else (MIT Press, 2010) and the forthcoming volume, Architecture Is All Over (2015). Choi’s work has been supported by The Graham Foundation for Advanced Studies in the Fine Arts, Society for Architectural Historians, Canadian Centre for Architecture, Princeton University, Harvard University, and Social Sciences Humanities Research Council of Canada, among others.